Hoard of silver Arabic coins found in East Ukraine. 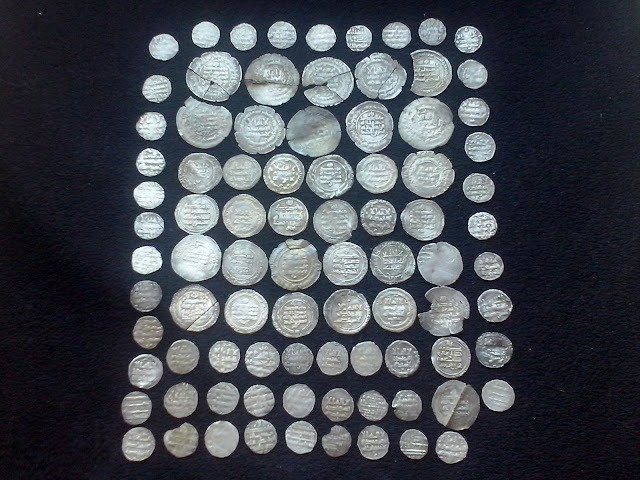 Numerous silver coins which dates back to the Samanid Empire (819-999 AD) and other artifacts were discovered by a metal detectorist in North-East Ukraine at a site by the Psel river in Sumy Oblast. Silver fittings, which are remains of a belt were also found with the coins and it is believed that the coins were kept in a bag or some kind of purse, attached to the belt. The coins are silver dirhams which were minted in the Samanid Empire, a Sunni Iranian empire, surrounding Afghanistan, and parts of Iran, Pakistan, Turkmenistan, Uzbekistan, Tajikistan, Kyrgyzstan, Kazakhstan and between 819-999 AD.